1. British India Adhesive Stamps Surcharged for Native States, Part I by C. Stewart-Wilson (Chamba, Faridkot and Gwalior) with four plates. 2. Same as No. 1 but Part II ( Jhind, Nabha and Patiala) with four plates. 3. Notes on the Postage Stamps of Bhopal by C.A. Anderson. 4. The Stamps of Jammu and Kashmir, Part 1 with six plates by D.P. Masson. 5. Same as No.4 but part 11 with eleven plates. 6. The Adhesive Fiscal and Telegraph Stamps of British India, by C.S.F. Crofton and W. Corfield, fully illustrated. 7. A revised edition in one volume of Nos. 1 & 2 by C.Stewart Wilson and B.Gordon Jones, fully illustrated. 8. The Postage and Telegraph Stamps of British India, with twenty-three plates by L.R.Hausburg, C.Stewart-Wilson and B.Gordon Jones. 9. The Fiscal & Telegraph Stamps of Ceylon, fully illustrated, by C.S. Croft on and B.Gordon Jones. 10. Supplement No. 1 to the Postage & Telegraph Stamps of British India , by L.R. Hausburg. 11. Early India Cancellations and Postmarks by W.Renouf. 12. British India Stamps used abroad, by W.Renouf. 13. A Catalogue of P.S.I. Exhibition, Bombay 1921 (H.R.H. The Prince of Wales Visit). 14. Supplement No. 2 to the Postage and Telegraph Stamps of British India 1922 Edition , By E.D. Bacon. 15. Supplement No. 1 to Early India Cancellations and Postmarks by W.Renouf. 16. Supplement No. 1 to British India Stamps Used Abroad, by W.Renouf. 17. Supplement No.2 to the Postage and Telegraph Stamps of British India, 1927 revised edition with 1 Photo Plate ( Essays , Proofs and Reprints) by E.D. Bacon. 18. The Half Anna Lithographed Stamps of India 1854-1955 with twenty plates , by E.A. Smythies and D.R. Martin. 19. The Four Annas Lithographed Stamps of India 1854-55 with twelve plates by D.R. Martin and E.A.Smythies. 20. Specialized Catalogue of Early Indian Lithographs by L.E. Dawson and E.A. Smythies with three Plates – first edition. 21. Same as No.21 - Revised second edition. 22. A set o f nine coloured plates for the plating of Half Anna and One Anna Lithographed Stamps by A.E.Stewart. 23. The Postage Stamps of Jammu and Kashmir Simplified by L.E. Dawson and E.A. Smythies. 24. The Postage Stamps of Nepal by E.A. Smythies, and L.E. Dawson. 25. The Japanese Occupation Stamps of Burma 1942-45 by G.L. Roberts and E.A. Smythies. 26. The One Anna and Two Annas Postage Stamps of India 1954-55 with twelve plates by L.E. Dawson. 27. P.S.I. Diamond Jubilee Souvenir 1957, containing many interesting philatelic articles. 28. Illustrated Catalogue of P.S.I. Diamond Jubilee "DIJUPEX" of the Exhibition. 29. The Handstruck Postage Stamps of India by D.Hammond Giles. 30. Essays of the India Provisional of 1925 by D.Hammond Giles. 31. Companion to the Handstruck Postage Stamps of India by Hammond Giles. 34. Reprint of The One Anna & Two Annas Postal Stamps of India 1854-55 (originally published by P.S.I. in 1948) with 12 Plates. 35. The Scinda Dawks and Lithographs of India (compilation of articles of Late Mr. D.E Wadia). 36. Stamps of Indian Native States (Compilation of articles of the Late Mr. P.M. Medhora). 37. 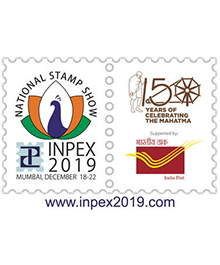 Souvenir of Centipex 1997 - National Philatelic Exhibition.